Lambeth Council offers free one to one cycle training for everyone who lives, works or studies in Lambeth. For no cost you can have one to one lessons to give you confidence to cycle around London. Whether you are new to cycling, havent done it for a while or are an experienced urban cyclist sign up for training now. The trainer from Cycle Confident will offer a personlised course of lessons and advice to help you ride more confidently. Here Lambeth Cyclists member Janet Paske reports on her experiences of taking up a Lambeth Borough Council subsidised cycle training session. "The last time I had cycle lessons was to help me pass my National Cycling Proficiency, aged 10, when I lived 4 miles outside Hereford. 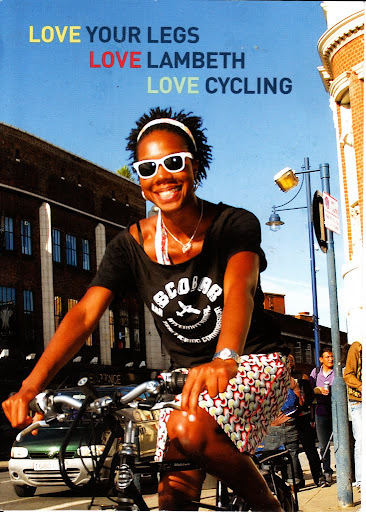 Thirty years later I live in Brixton, and have cycled regularly in London for 10 years. So I thought now was a good time to take advantage of Lambeth Council’s offer to update my skills. On the day I met with my trainer, Laura, in Brockwell Park. I soon discovered that I wasn’t holding my handlebars the best way ie with fingers outstretched over the brakes, so that both brakes can be used immediately. She checked my control skills and I learnt a new way to swerve around things like potholes, reducing the chances of having to swerve again. The most important thing I learnt was positioning on the road. Start as you mean to go on is the message. When starting, I should put my bike at the place in the road where I intend to cycle, not closer to the kerb or parked cars. Positioning is also very important as you approach a road which narrows – I have been cut up so many times by car drivers who think they can get past me. Now I know to pull across to the middle of the lane – “to take the lane” - so making it clearer that it is not possible to overtake. Overall, I would recommend the training. Despite over 10 years experience in the saddle, I learnt some new techniques and approaches which will make my cycling safer. And it is never too late to do that!"